Dove Thermal's product development experience takes in over thirty high street and industrial machines and appliances: from table-top wine coolers to packaged water treatment equipment, from cash dispensing machines to diesel-electric nosemount chillers, from white goods dehumidifiers to gas-fired bakery tunnel ovens. We have designed and built temperature conditioning equipment for airframe and engine fuel systems, environmental control units for aero engine test plant, and developed NDT methods to identify causes of structural failure in large rotating machinery. The Westra Dehumidifier (below) was sold in Electricity Showrooms across the country. While many of our projects are directly concerned with chemical or food production, some relate to thermal equipment, systems and processes for improving the mechanical testing of - for example - diesel engines, gas turbines, hydraulic equipment, metal filters, thermal clothing and soft goods, and various aerospace components. Innovations designed to address a client’s immediate requirements can become marketable products in their own right. We invented and built a compact reactive mass balancing system to eliminate machine vibration and reduce noise emission from centrifuging dryers - in which mass and load distribution varies with run time. In contrast to the intricacies of conventional electro-mechanical arrangements, the only moving part in its detection stage was the core of an LVDT (Linear Variable Differential Transformer) to gauge micron-scale shaft displacements. Our working prototype employed a dry ballasting arrangement which we later developed for use in other types of rotating equipment where mutually variable masses and their distribution give rise to noise and vibration issues. We originate test plant and procedures for companies who wish to outsource product development projects, and to support our own design programmes. 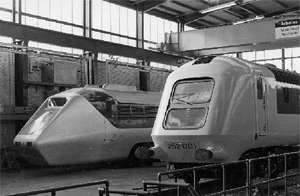 Examples include DMU-Railcar engine management groups, test bed development of the original HS125 locomotive unit, enhancement of manufacturing processes, and locomotive cooling air porting arrangements. Dove Thermal has designed and built temperature conditioning equipment for airframe and engine fuel systems, environmental control units for aero engine test plant, and NDT methods to identify causes of structural failure in large rotating machinery. Typically, test methods and equipment have been developed to optimise routing of automotive exhaust systems, the stability of blown film extrusion processes (above), and to neutralize vibration in large rotary expressing machines. Process control software and equipment designed for thermal product development purposes might subsequently be embodied into production plant and machinery upon fulfilment of its original function, or development routines embedded into the control PCBs of finished domestic or industrial goods. An autoclave control system we developed for manufacturing racing car and aircraft seats enabled production units to operate as environmental test chambers capable of creating and controlling extreme thermodynamic test conditions. Other dual-role examples typically include production testing stages for quality and performance assurance - as for Foseco thermic lances and metal filters, GEC Gas Turbines engine systems, J.I.Case hydraulics test beds, and several more.